Ep.8: Does it Take a Gift to Succeed as a Singer? Does it Take a Special Gift or Talent to Succeed as a Singer? “Gift” and “talent” is often used interchangeably so let’s separate the two. First gift. A “gift” is given to you without any effort or work on your own. I’ve had young students, 5 years old, who can stand up and sing the daylights out of any song. Then I’ve had students who are in their 30’s who struggle to find the right pitch. The 5 year old has a gift. She can just do it. She started singing almost before she could talk and she’s never stopped. It’s like she was born with it. It’s in her genetic makeup. Many of these gifted students have parents or grandparents who are singers. They literally have inherited vocal cords and physical characteristics in their anatomy that makes singing come natural to them physically. That’s a gift. Does it Take a Gift to Succeed as a Singer? So what’s a “talent”? Talent is more about passion, compelling interest and drive. It doesn’t mean that there is a special genetic gift to sing. For example, suppose a 16 year old young man had a great passion for singing but just an average voice. Yet he works at it very diligently for years, practicing and applying himself until he develops a tremendous following who like his singing voice, style and he becomes a star. He wasn’t gifted but his talent drove him. As a result, he worked until he succeeded. What about the gifted but not talented. This is a singer who opens their mouth and out comes a wonderful singing voice but has very little interest in singing or developing or growing. They remain gifted, but don’t do anything with their gift. Talented but not gifted. This is very common. Average singing ability, average voice..but interested and willing to work. How hard he works depends on how talented he is. His talent drives his development and passion. How about the gifted and talented. Michael Jackson, Beyonce, Pavarotti, Barbra Streisand, Lady Ga Ga, etc. They have a gift and talent. The combination creates world class singers and performers. Maybe that’s you! In my opinion most great successes in the world of singing and performing are talented, but not necessarily gifted singers. It’s their talent that propels them to work passionately and hard. They never give up. They are always working to build, improve, grow and develop. They listen, they take feedback. They put together the right team to help them accomplish their goals. They take risks. They work through the mistakes and learn from them. Eventually becoming singing stars. Your Personality May Need to Change! What makes singers successful is usually more about attitude, desire and work. It’s also about personality. If you are crippled by shyness and you are worried about taking personal risks or embarrassment, you will have to work doubly hard. You can’t be afraid to sing in front of other people and expect to be successful. You have to put yourself out there and make things happen. That’s doubly hard if you think you are shy and quiet. You can do it, if you change the way you think about yourself. One of the common questions I get from new students is can I do this? Do I have the ability to be a successful singer. Essentially they are asking if they have a good enough voice to succeed as a singer. Maybe a better question is do you have the ability to work at it. To work long enough to see progress. Do you have the stick-to-it-iveness to develop your voice. Does it take a special gift or talent to succeed as a singer? How badly do you want it? How intense are your desires? Is your passion medium to lukewarm or is it a burning white-heat drive? The good news is, unless you are deaf, or one of the 4% of the world born with congenital amusia (tone deafness), if you have the desire and drive…the talent, you can succeed as a singer even without a special gift to sing! Do you know your vocal type? I’m not talking about whether you’re a soprano, alto, tenor or bass. Your vocal type is what you tend to do when you sing. Once you know your vocal type you can begin eliminating weaknesses in your voice and get the singing voice you want. Visit PowerToSing.com. Take the PowerTest and the quiz. Immediately you’ll discover your vocal type. 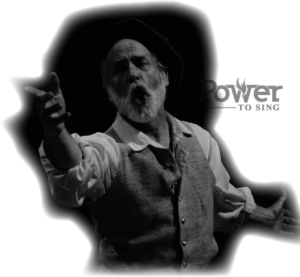 Explore the Knowledge Center on Power to Sing’s website. Learn about your vocal type and the exercises that will help improve your unique voice. You can sing higher with beauty, confidence, and power. Ep.53:How to Improve your Singing Voice! 5 Tips You Will Not Like! Ep.74: Singing with Confidence – It’s NOT About How Good Your Voice Is!